"In August, the large masses of berries, which, when in flower, had attracted many wild bees, gradually assumed their bright velvety crimson hue, and by their weight again bent down and broke their tender limbs." I’m melting! Now that was a July! How did your plot enjoy the heat? Plants around the garden are looking a little worse for the wear but plenty of gardeners have seen their harvests keep coming. If you over-planted, the amount of tomatoes, cucumbers and squash you are taking home right now can almost be overwhelming. Now what to do with all that produce? We’ve been sharing recipe ideas every few days on the OVF Facebook page, but please feel free to contact us with some of your own. Follow the links in the above paragraph for some other recipe suggestions. Don't forget, if you're up to your ears in produce, you can drop off your excess harvest every Sunday to the OVF Donates program. August is a time for harvesting and eating and not so much a time for planting or anything else that involves breaking a sweat. 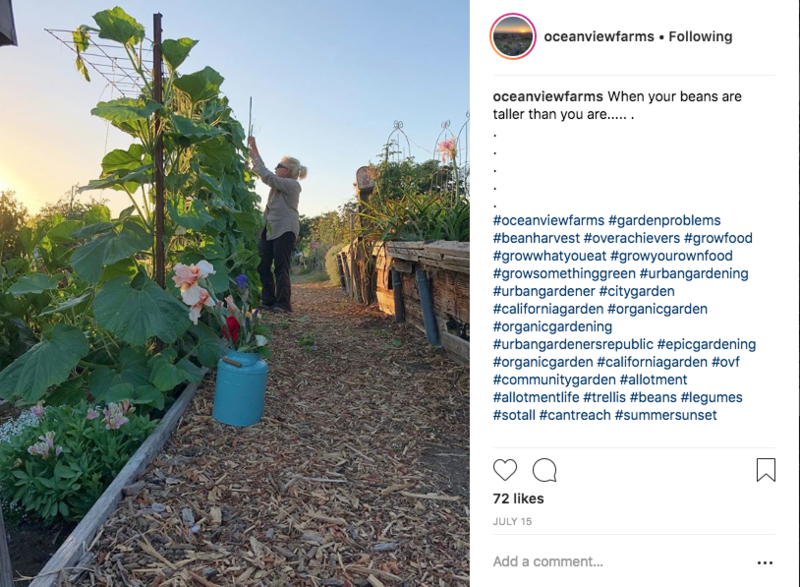 The Gardening in LA blog has a list of suggestions of what to do in August. However, we have experienced some triple digit heat the last few Octobers and Novembers so remember to proceed with caution before putting any cool weather crops into the ground. The 11th Annual Ocean View Farms Tomato Tasting is in the books! We had 54 submissions, including 44 different varieties from 22 different gardeners. This year, we focused on making the Tomato Tasting as educational as possible. 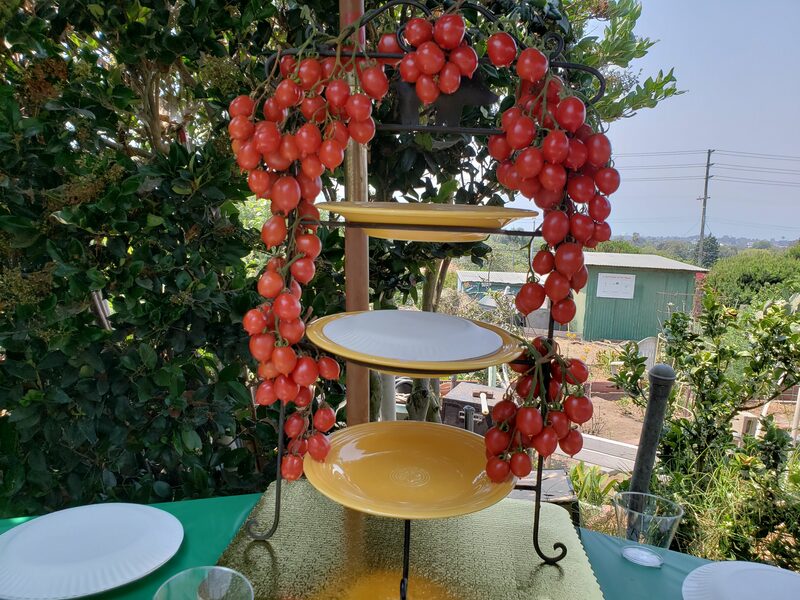 We included the tomato variety on the plate to ensure everyone knew what they were tasting, and encouraged gardeners to ask each other about their tips and tomato tricks. Further to that effort, if you visit this website you can see all the submissions with their gardener's name. If you remember liking a particular number, feel free to reach out to that gardener to let them know! After all votes were tallied, third place went to Steve Ballantine (2L D36-38). Upon hearing he'd won, Steve remarked, "What?! I don't know anything about growing tomatoes!" We respectfully disagree, Steve. Second place went to David Clayberg (1M D22). His Piennolo del Vesuvios were delicious, and his beautiful wrought iron tomato display was the perfect centerpiece for the buffet tables. First place, and a bright blue ribbon, went to Shirley Best (4L A61). Shirley's Dark Galaxy tomatoes had such a great taste / texture, and had fantastic coloration of orange with purple shoulders. As for advice, Shirley shared that she uses earthworm castings and Dr. Earth's Organic Liquid Fertilizer. 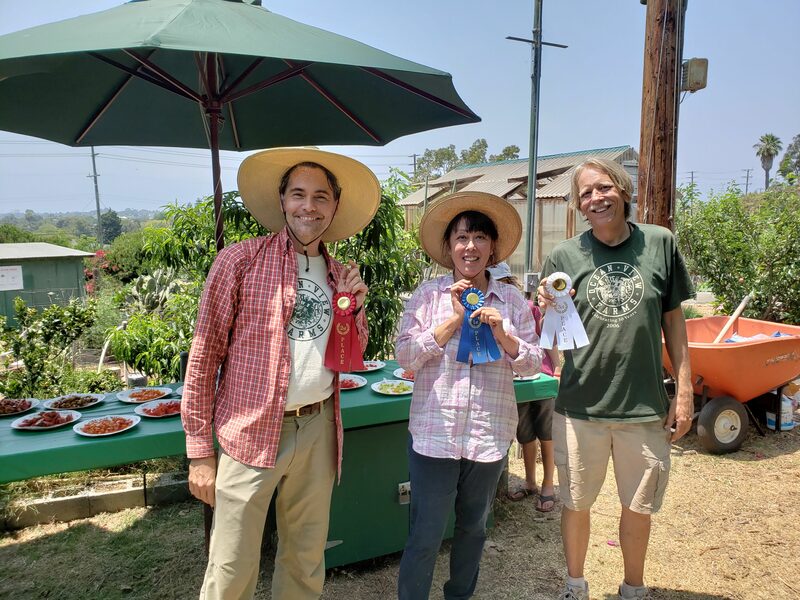 Honorable mention goes to Dean Cleverdon and Nancy Nyberg for submitting the most varieties of tomato that received at least 1 vote -- 4 different varieties! 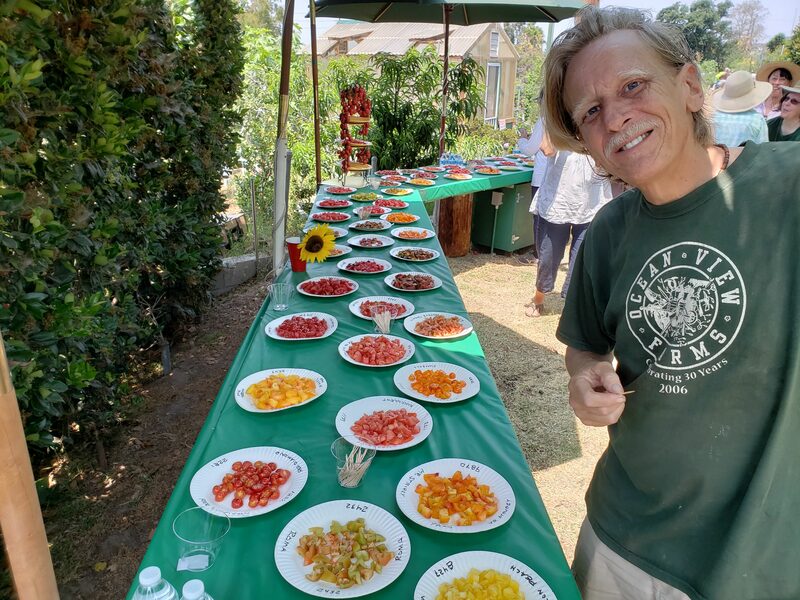 Thank you to all the volunteers who made this year's Tomato Tasting such a wonderful experience. And special thanks especially to Dean and Nancy, who not only provided us with lots of interesting varieties to taste but also did an excellent job of keeping the Tomato Tasting organized. Lastly, thank you to Education Chair Andy Morris for overseeing the entire day. We hope you all had fun, and are looking forward to next year! During the July board meeting, a motion was passed banning ALL tomato plants from the compost area. Gardeners are now required to dispose of tomato plants and trimmings in the Green Waste bins or in the dumpsters. Hopefully this new amendment to Rules and Regulations will help slow the proliferation of tomato blight in the garden.